Super soft comforter and pillows. The boys love their new bed set. 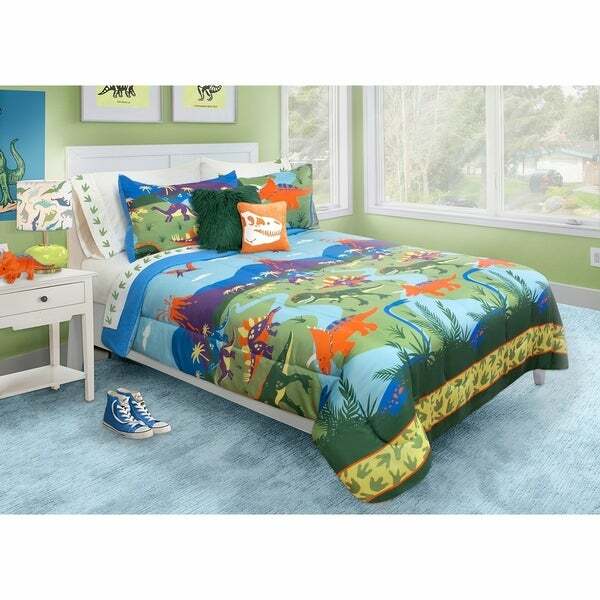 This Dinosaur Comforter Set is part of our newest designs from our Just Kidding collection. 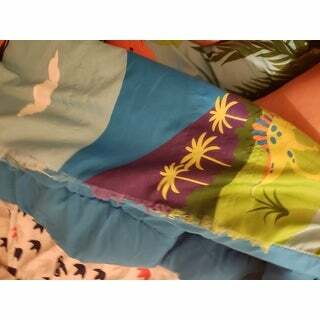 We make bedding fun and your child will love this exclusive design and the comforter is light, soft and warm and cozy. UPDATE: Customer service promptly sent me a new comforter. Very kind, easy to work with and appreciated. HOWEVER, the new comforter arrived with not one but TWO rips! Pictures below. Ridiculous. My 2 year old son slept with this comforter for 3 nights before it ripped along the side seam. Very disappointing. This set is pillowy, bright and cheerful, perfect for my dinosaur-loving grandson. I like the fact that the graphic design displays a whole world of dinosaurs... unlike some other sets I looked at. And the price is right! No regrets. Great quality, great price! My 2 year old will be moving to a big bed soon and has been SO excited about this set. Good length for a queen bed too! My son will love this! The quality looked great and the colors were vibrant. This was nice quality and shipped super quick. The colors are vibrant and my grandson will love it! Ordered for my 4 year old son. He loves it. Good quality, vibrant colors. 2 pillowcases included. Order came in a timely fashion and was as described. Would order again. Colors are exact as picture. Grandson loved it. Soft and easy to clean. "Is this heavy/thick? Or is it thin enough to be thrown into the washing machine?"